The more I learn the more I realise that for total Wellness you have to address every aspect of your life, emotional, physical and spiritual. What is a Wellness Package? A Wellness Package is a treatment plan tailored to your individual needs. Whether you have a health condition, chronic pain, poor sleep or just wish to improve your health both emotionally and physically, then a Wellness Package maybe ideal for you. A Wellness Package consists of Wellbeing Coaching Sessions plus any of the Complementary Therapies that I practice. Your Wellness Package is tailored to your individual needs. During your initial one hour consultation, I will go through the Wellbeing Wheel with you, this give me a really good snapshot of where you are, what you are doing well and which elements need work in order of priority. Follow-up sessions are bought as a Wellness Package, which can be broken down into sessions of 15 minutes to one hour depending on your needs and energy levels. During your sessions I work with you to help you set and achieve your wellness goals, help you understand who you truly are, and share coping skills with you for a well life. We can tailor these sessions to your individual needs and include Complementary Therapies where appropriate. In my experience, where there is often the biggest resistance in addressing an area of the wellbeing wheel, this is the area where we have the biggest breakthroughs. This is why when working with me as your Wellness Coach I can give you the best support, guidance and encouragement you need to make these important breakthroughs. My passion is to teach and empower you to be the ‘Best You’ you can be. Wellbeing coaching is a holistic approach to examining how your personal wellbeing interacts with your values, goals and motivates you. It looks at every aspect of your life. 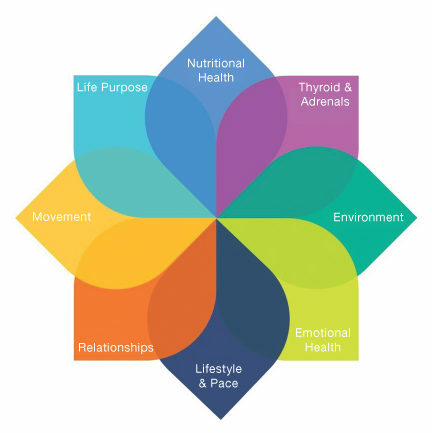 The Wellbeing Wheel addresses 8 key areas, Nutritional Health, Energy Levels (Thyroid & Adrenals), Emotional Health, Environment, Lifestyle & Pace, Relationships, Movement and Life Purpose. By using the 8 Areas of the Wellbeing Wheel I will coach you through each of these areas and help you set and achieve your health and wellbeing goals. In my experience, where there is often the biggest resistance in addressing an area of the wellbeing wheel, this is the area where we have the biggest breakthroughs. This is why when working with me as your Wellbeing Coach I can give you the best support, guidance, encouragement and accountability you need to make these important breakthroughs. Wellbeing coaching is there to motivate, inspire, teach and support you, helping you regain your health and happiness. A Wellbeing Coach is there to guide you to bring about a clearer understanding of your issues or concerns, helping you to re-frame and interpret them, then helping you move forward to the goals that you wish to achieve. Having a Wellbeing Coach gives you that support and accountability to move forward and make the necessary changes to regain your health and vitally. As part of your Wellness Package and to compliment your Wellbeing Coaching sessions I also offer the following Complementary Therapies. To compliment your Wellbeing Coaching sessions I also offer the following Complementary Therapies, these are included in your Wellness Package. Your Wellness Package hours can be broken down into 15 minutes slots, this gives you a more personlised way of working with me which is specific to your needs. You may cancel your Wellness Package at anytime. Any unused whole hours will be refund minus £75 for administration changes. I work closely with a team of Independent Complementary Practitioners who have a broad range of modalities, including being Registered Nutritionists, Psychotherapists, Counsellors and Trauma Release practitioners. Where a cross referral is made the client will pay the other Complementary Practitioner directly.